The alcohol urine test checks for the presence of ethanol in the urine. Alcohol testing measures the ethyl alcohol urine level. Why is the alcohol urine test important? Urine alcohol testing is used for general screening or as part of tracking in alcohol abstinence programs. This Alcohol Urine Test is a urine test. The alcohol urine test, also known as an alcohol lab test and ethanol urine test, measures the ethyl alcohol urine level. Ethanol, also known as ethyl alcohol or just alcohol, is a commonly abused substance found in beverages such as wine, beer and liquor. Ethanol ingestion can cause a variety of symptoms, ranging from a sense of well-being and decreased social inhibition to depression, anxiety, and aggression. In addition to being consumed recreationally, alcohol is also present in certain types of medications and mouthwashes. Ethanol is also used as an antiseptic and is found in specific types of soaps. Alcohol is also used to counteract methanol and ethylene glycol toxicity from ingestion. To get an alcohol urine test near you, order online and get your urine tested at the Quest Diagnostics lab that you chose. 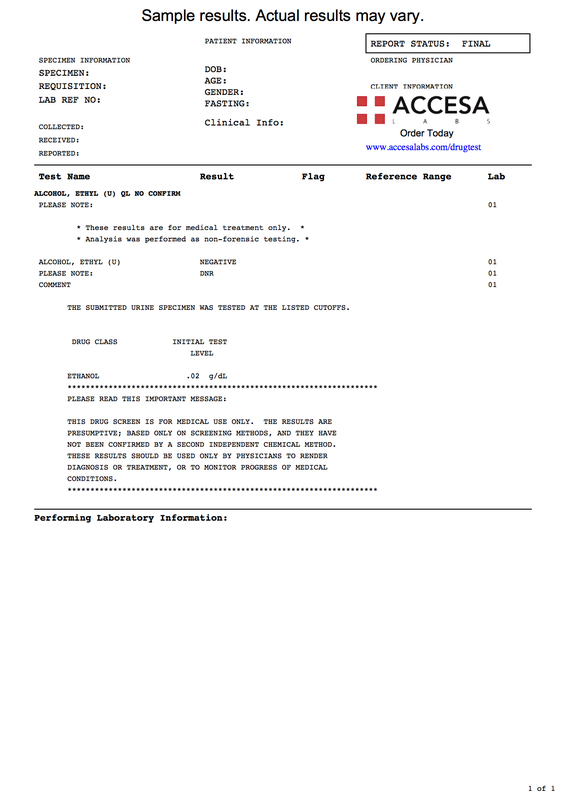 Once the urine alcohol lab report is ready, it will be available for download. As can be seen on the sample alcohol urine test report, a negative result will be reported if no urine alcohol is detected. To check the alcohol blood level, the alcohol blood test is a better option. Please note that this ethyl alcohol urine test is not a chain of custody test. Alcohol Urine Test at Guaranteed Prices.